The 7th International USk Symposium, which takes place in Manchester, UK, July 27-30, is now less than six months away! Early registration is sold out; standard registration begins March 5. Programming will be announced this month. You can now find Symposium information on the Urban Sketchers site by clicking the USk Symposium link from the top menu. This page will feature information about programming, sponsors, registration, travel and other news. You can also sign up for the Symposium mailing list, join the Facebook group (for discussions), follow us on Twitter, search #USkManchester2016, and visit our Facebook page (for announcements). 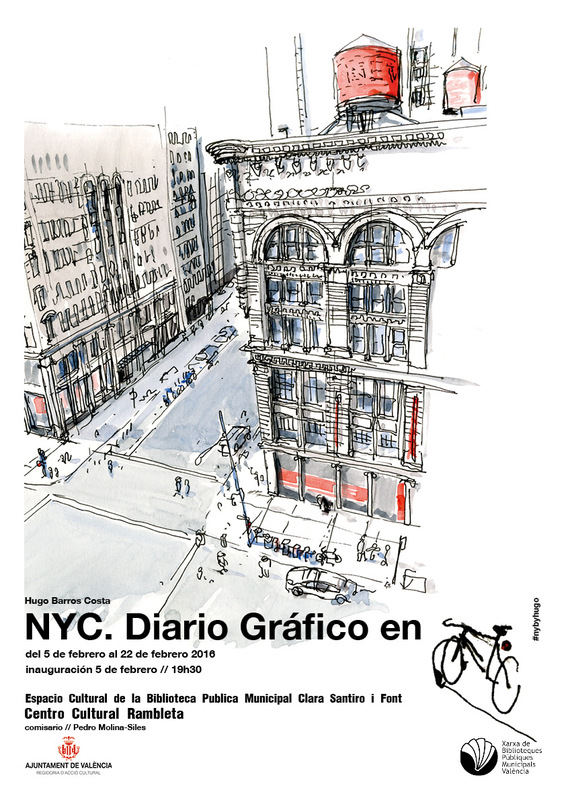 The Urban Sketchers Executive Board will meet in person this month in New York City (USA). The agenda includes reviewing the previous year and planning for the next. The entire Urban Sketchers board will meet Saturday morning, as the Advisory Board meets with the Executive Board on Skype. "We are hoping their questions and input will help guide our weekend of strategizing," said President Elizabeth Alley. 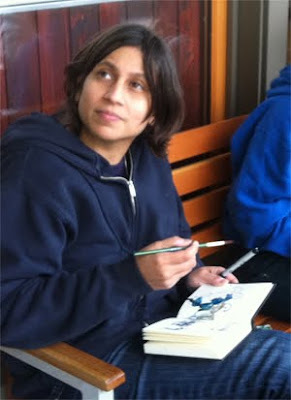 The Executive Board is also looking forward to sketching with Urban Sketchers NYC. The USk Advisory Board, which brings a wide array of people, experience, knowledge, viewpoints and skills to the mission and work of the organization, welcomes two new members: Richard Alomar and Gabi Campanario. Richard already acts as an advocate and ambassador for Urban Sketchers, and of course Gabi is the founder and a former Executive Board member. "We’re happy to continue being inspired by these two," Elizabeth said. Urban sketchers were recently asked to contribute to a survey about USk initiatives. "We will use the feedback to help with planning," Elizabeth said. "After our meeting, we will announce a public chat via Facebook to let you know more about the ideas and work generated from the meeting." Welcome to four new Regional Chapters in Australia: Melbourne, Sydney, Canberra and Brisbane! The Communications Committee welcomes its new volunteers: Lisa Ennis from Alabama who is helping with Workshops promotions; Lauren McVittie from London, Ontario, who is updating the USk Wikipedia page; and Kate Gorman from Washington, DC, who is updating our Facebook pages. 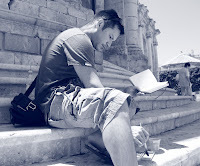 USk would like to thank the many volunteers who have translated the new Regional Chapter Guidelines into 11 languages so far: Basque (Josu Maroto), Chinese (Alvin Wong), Hebrew (David Mitchell and Michal Orbach), Italian (Filippo Bottini), Brazilian Portuguese (Fernanda Van Campos), Portugal Portuguese (Mario Linhares and Pedro Cabral), Spanish (Gabriel Ronco Losada), Swedish (Ida Bellarian), Dutch (Lara Emde), Malaysian (KL USK Malaysia), Korean (Sung Hee Park). The layout is by Ch'ng Kiah Kiean. Thanks to the work of volunteers Don Gore and Liz Watkins, USk saw a burst of 10,000 new Instagram followers since Christmas Eve, bringing our numbers up to 50,000 followers! As you've seen by now, we've made big changes to the Urban Sketchers site! The new mobile-friendly design looks great on your smartphone and tablet as well as your laptop. Our correspondents and guest contributors have higher visibility with eye-catching galleries displayed at full width right on the home page. New sections highlight older posts you may have missed. Information and sketches can be found more easily by locale, author and storytelling theme by clicking on red labels next to the headlines or below each post. Please take a look around -- we hope you like what you see! 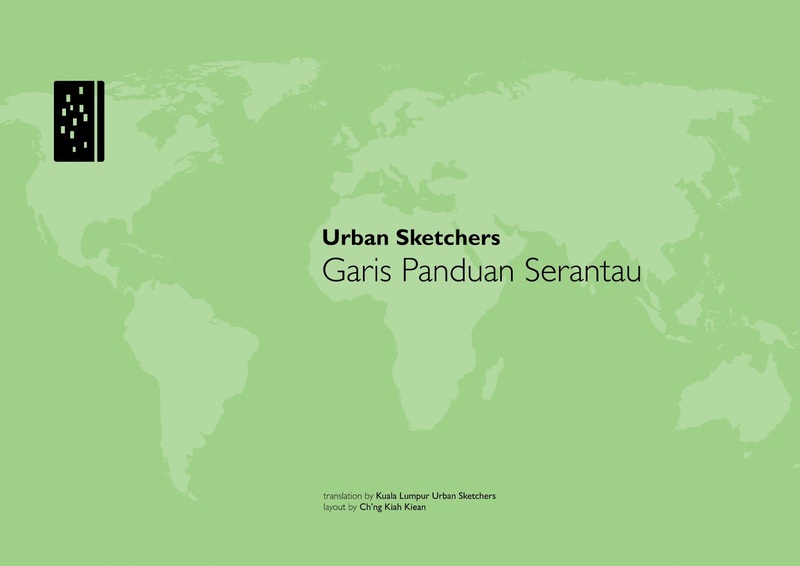 Learn and be inspired at an Urban Sketchers workshop near you! Workshops in Newbury, Orlando and Seattle are filling fast (workshops in Galway and Lisbon are now full)! Tacoma, Washington (USA), is hosting the Fourth Annual West Coast Urban Sketchers Sketch Crawl Aug. 19-21, 2016. Beijing Urban Sketchers celebrated New Year with a sketch exchange. Newly established Beijing Urban Sketchers had their first New Year Party Dec. 27. Everyone brought one sketch for a mini exhibition and exchanged them as a New Year gift. According to Flora Wang, Beijing Urban Sketchers now has 32 active members and more than 200 followers. KW Urban Sketchers is three years old! 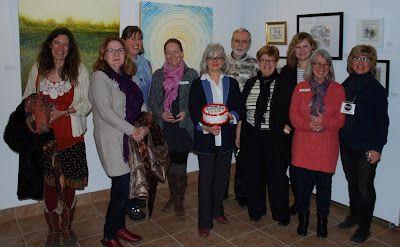 KW Urban Sketchers in Kitchener/Waterloo, Ontario, Canada, hosted their second art exhibition held at the Art District Gallery Jan. 15 to coincide with the chapter's third anniversary. According to Brenda Murray, 14 artists celebrated with cake and champagne, and one sketch sold on opening night! Toronto (Canada) Urban Sketchers has self-published a book, Urban Sketching Disappearing Landmarks in Toronto, on Amazon. 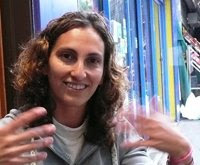 Marie-Judith Jean-Louis was interviewed on a local radio program about the book. Urban Sketchers Tri-Cities (USA) will be the featured artists in the upcoming Allied Arts: The Gallery in the Park's February exhibition in Washington state, which opens Feb. 7. The presentation will preserve the look of the sketches by enlarging favorite drawings, printing them on matte paper, and adding a foam core backing, said Jim Bumgarner. "No frames, no glass, no matte boards - just prints." 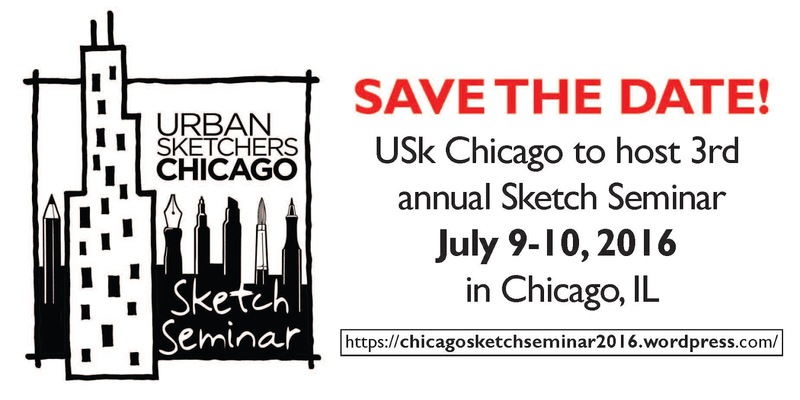 Urban Sketchers Chicago (USA) is excited to announce that the Chicago Sketch Seminar 2016 blog is live. According to Andrew Banks, this will be the main hub for all Seminar information, including workshops, activities, instructors, registration and sponsors. 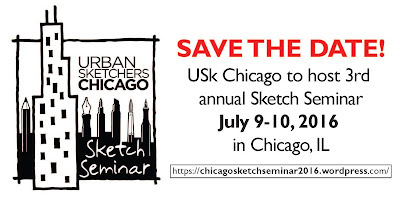 Sketch Seminar, USk Chicago's annual sketching education event, will be July 9-10 this year. Pune Urban Sketchers exhibited their sketches at a construction expo. 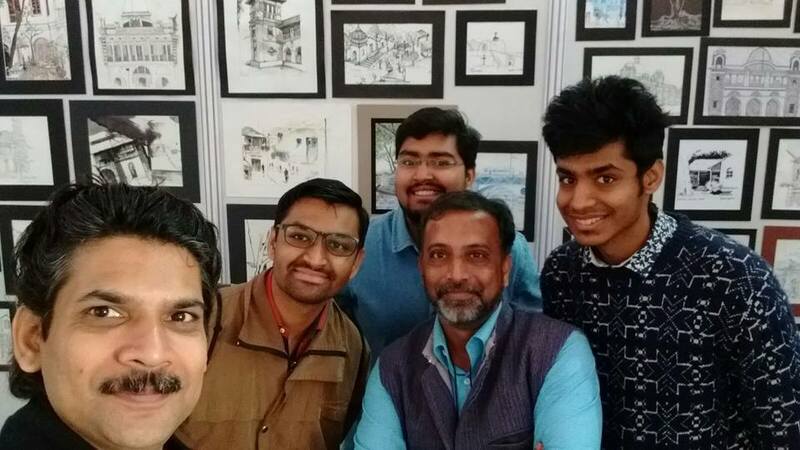 Sanjeev Joshi reports that Pune (India) Urban Sketchers showcased their sketches in a recently concluded construction material expo, CONSTRO 2016, in Pune. "We were given a small stall to exhibit our sketches," Sanjeev said. "We received many visitors, and they appreciated the sketches and the urban sketching concept." Juan Valle Lindez reports that USk Almería, founded in 2014, has about 50 active members now. Almería is a town in the southeast of Spain on the Mediterranean Sea. "The weather here is fantastic," Juan said. "Many centuries of history provide an opportunity to sketch monuments and great sites." The driest region in Europe, Almeria's desert "has been the location of many famous films -- Indiana Jones, Lawrence of Arabia, Conan, Mad Max, Patton, Exodus -- and it is perfect to sketch." Florian Afflerbach (Germany) is included in a new book, How to Keep a Sketch Journal - a Guide to Observational Drawing and Keeping a Sketchbook. 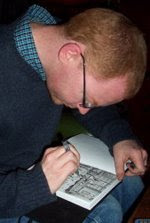 One of eight artists featured in the book, Florian contributed two step-by-step introductions to shading buildings with pencil and the use of pen with alcohol-based markers. Teoh Yi Chie has reviewed the book on his blog. Jeroen Janssen will have a signing party Feb. 4 at Sint Lukas in Brussels for his new book, Abadaringi, which includes 320 pages of color drawings. Rolf Schroeter reports that Gabi Campanario's Urban Sketching Handbook on Architecture and Cityscapes has been translated into German. 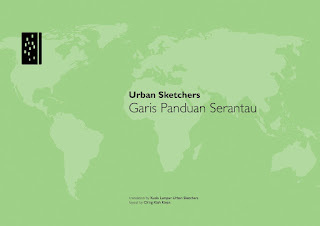 Urban Sketching - Zeichnen in der Stadt, Architektur und Stadtlandschaften is available at dpunkt.verlag. The translation of People and Motion is expected this summer. 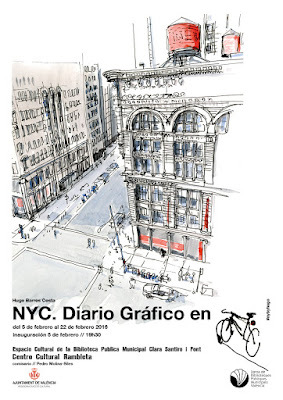 Hugo Costa's sketches of NYC are traveling to Valencia. Hugo Costa (Spain) is currently in New York City teaching at the Parsons New School. For the past four months, he has been bicycling through NYC to "produce a graphic diary of this city," Hugo said. The drawings were recently exhibited in NYC and will now travel to Centro Cultural Rambleta, Valencia, Spain, for a show that opens Feb. 5. The sketches are part of a series of 300. "Trying to 'see' this amazing city, from Long Island Beach to the Bronx, through drawing has been such a visually enriching experience!" Hugo said. "Intending to express the atmosphere, light and forms I felt under the Brooklyn Broadway metro beams was as thrilling as intense and stirring. New York is so different now after all these experiences!" Hugo would like to thank Mark Leibowitz and Raylie Dunkel for their work organizing weekly USk NYC events. The Italian newspaper La Repubblica/Napoli published one of Simo Capecchi's sketches in an article about Urban Sketchers. The sketch is of an artisan-made angel statue reproduced from the 18th century. In a recent blog post, Simo showed additional sketches of the Naples factory where the statue was made. 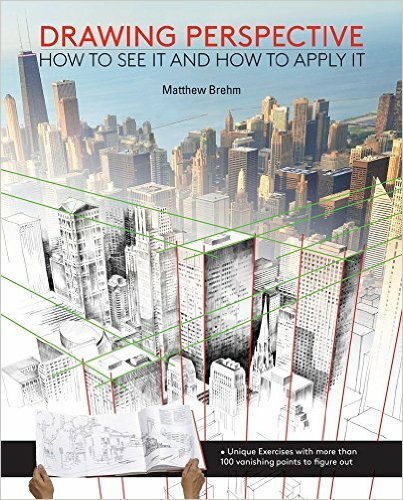 Matthew Brehm's new book, Drawing Perspective, is available to preorder on Amazon. Matthew would like to thank the many urban sketchers who contributed. 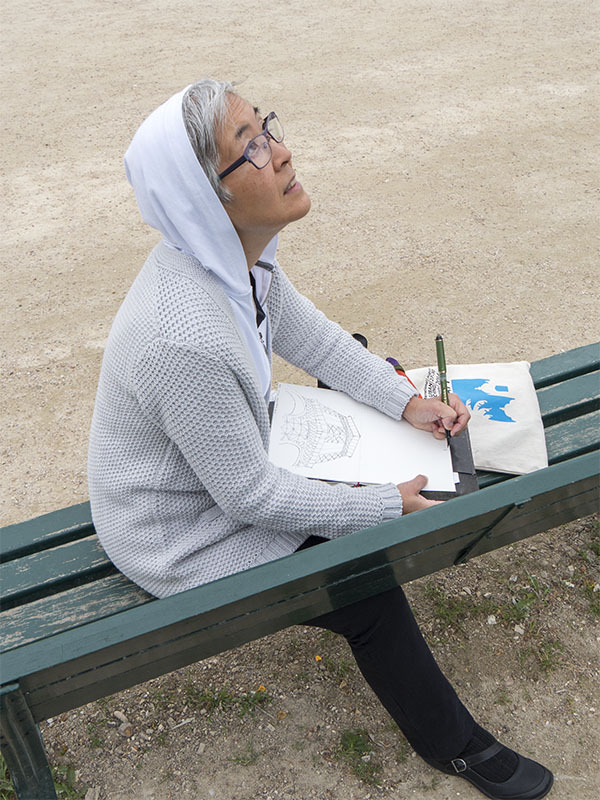 Not seeing anything about you or your Urban Sketchers group in Drawing Attention? Then we want to hear from you! Please send your urban sketching news items with links and images to: drawingattention@urbansketchers.org. Or tag me, Tina Koyama, on news you post on the Urban Sketchers Facebook page. Subscribe by e-mail. Happy sketching!